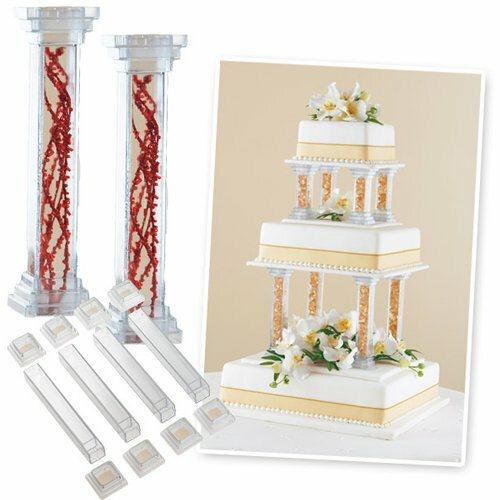 Home › Home and Kitchen › Wilton Enterprises Fillable Pillars Cake Decorations 12 Pack 6"
Wilton Enterprises Fillable Pillars Cake Decorations 12 Pack 6"
A great way to add reception colors or themes to a classic white wedding cake design. Fill pillars with colorful gems, ribbon or decorative stones to personalizeyour cake design! A great way to add reception colors or themes to a classicwhite wedding cake design. Pillars are designed to be used with WiltonDecorator Preferred Separator Plates in a variety of sizes and shapes. Setsinclude 4 pillars, 8 pedestals. Not recommended to be filled with any type ofliquid. Plastic.